West Bank? What’s that all about? Short guys who wore several hats at once, gunslingers, farmers and beautiful women; this game certainly had variety! 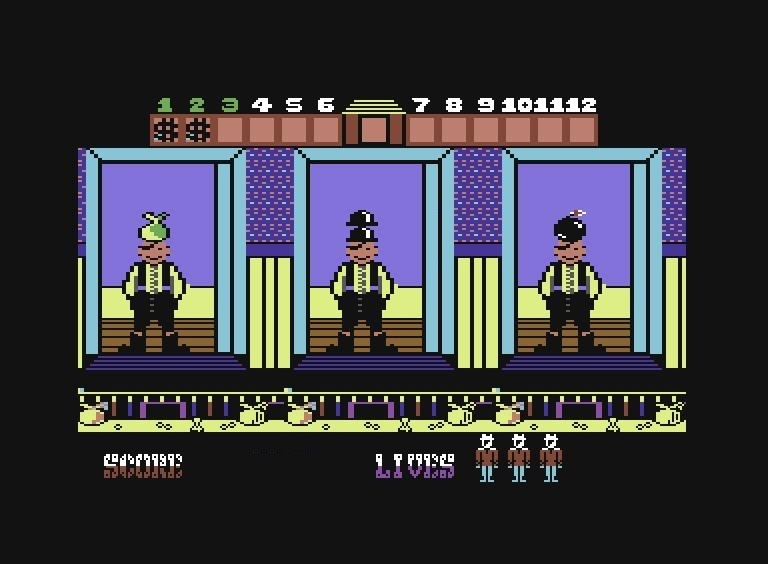 The player would sit behind the counter of a bank, three doors opened randomly and a unique character appeared – quick action was required, depending on what showed behind each door. Playing this was fortunately not just a simple matter of shooting at whoever looked like they deserved a bullet. That would get boring rather quickly. 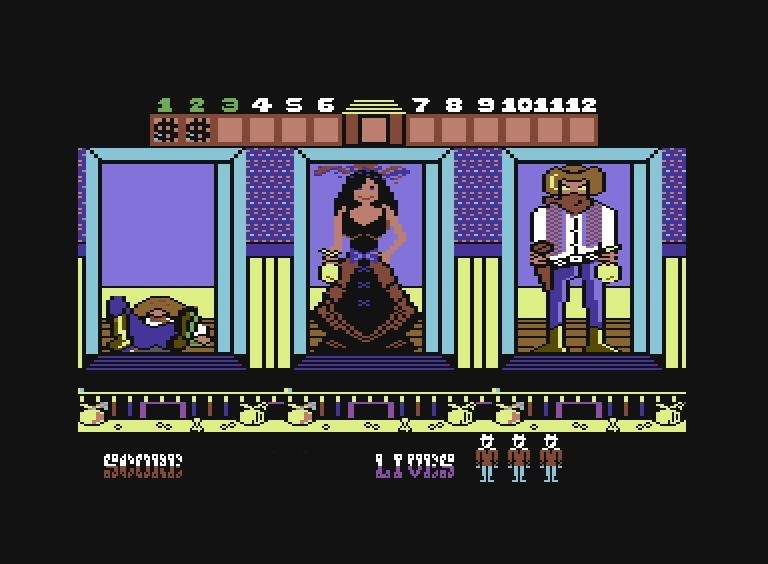 How did this western themed Commodore 64 game play then? Almost all characters who showed up, were holding a moneybag, though some also had a a gun drawn; a clear sign they need to be taken down immediately. Aiming at each door was simple, as the crosshair would point at each depending on whether you moved it left, right or not at all, and pressed the fire button. If you were aiming for a high score, you could not just stare at the doors, shooting at random, because you were not allowed to kill someone who had not drawn their gun. During earlier stages this was not something to worry about, as all with evil intent showed up with a gun pointing at you. But as the game progressed, the bad guys became more sneaky and several character types were added. In order to make it even more difficult, the gunslingers did not always draw before leaving and closing the door again.. guess they had a change of heart? Even after the door had opened and an innocent woman showed up, sometimes a bad guy would push her aside and take her place – his mind fully set on putting you six feet under in order to get away with the gold! The nerve..
Let’s not forget about the short guy with hat-on-top-of-hat either, who made for good target practice. One would do well not to just fire away however, because after all hats were removed a bomb could appear! But there could also be money under those hats, so removing them was never a bad idea – just be careful not to shoot what was underneath them. So that’s how to play the game.. how did it look and sound? It might not have been the best looking game of 1986, though it was definitely not the worst either. The animations got the job done, but not much more. The visual style definitely gave an illusion of letting you know that this is the old west. Characters were detailed, with the bad guys changing their facial expression slightly upon drawing their gun. There are not a lot of sounds to talk about, apart from guns being fired and bombs blowing up and they sound as good/bad as about any other game around this time. There are quite a few games from the 1980s that have great music, but this is certainly not one of them. The music is only catchy, not good. Do ya feel lucky.. punk? Even with the lack of good music, this Commodore 64 game is still a classic in my books. It may not have the depth of other games from that year, such as The Legend of Zelda, Metroid or Castlevania, but what it does have is a feeling of undeniable nostalgia. 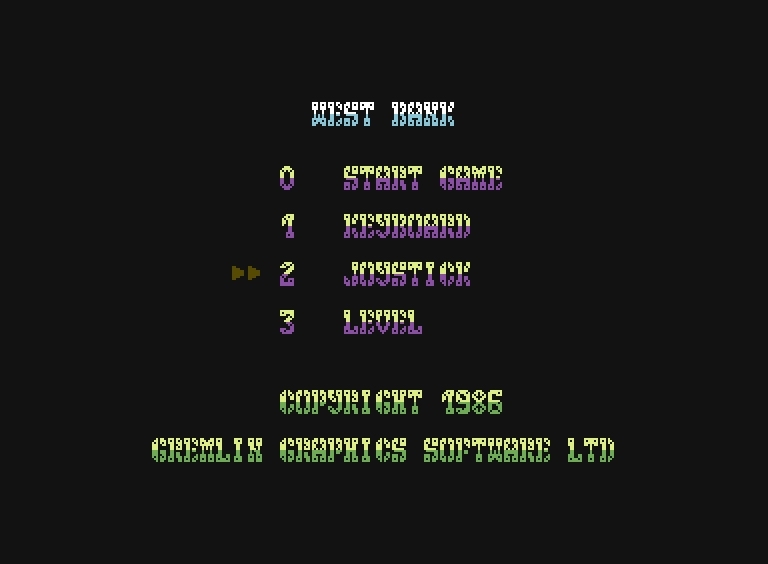 West Bank was also rather addictive, since this one is mostly about getting a high score (which I never did manage! ).